This is my mom’s recipe and she used to prepare this for breakfast during our school and college days. I used to take it for lunch and most of the time my classmates used to finish my lunch box and they used to exchange their lunch box with mine. roasted bread pieces for garnish. Wash the rice and strain and keep aside. Chop beans and carrot into small pieces, slice onion and keep aside. Grind coriander leaves, cloves, cinnamon, green chilli and salt into fine paste. Heat pressure cooker add oil and ghee add sliced onion fry till light brown then add coriander paste fry for 3 to 4 min, then add chopped vegetables mix well fry for 2 min. Then add strained rice mix well add 4 cups of water pressure cook till 3 whistles.add roasted bread pieces and Serve hot with salad. 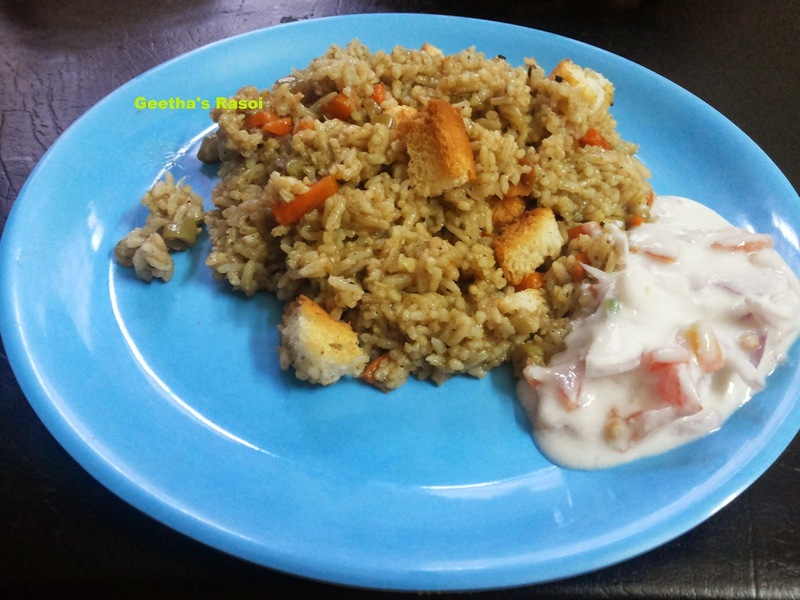 Tasty veg pulav ready to eat.